I saw fringe, and I jumped at the chance to own this beauty. Paired with my fave chunky sweater, you really can't go wrong. Today, at work, we had waffles with nutella and whipped cream as a snack. Yes, you read that correctly... I ate that at work. It really doesn't get much better than nutella covered waffles. I think my diet thinks otherwise, oh well! I can't even talk about how fabulous this clutch is. I think this photograph speaks 1,000 words... need I say more? 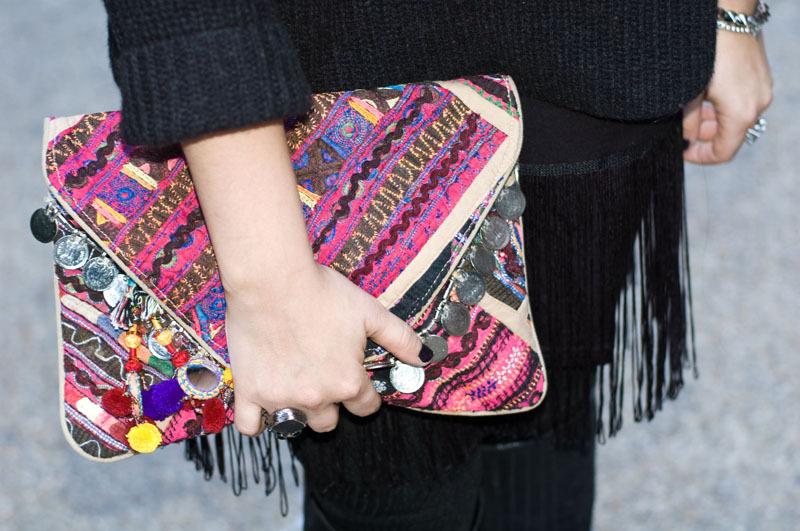 Love love love that clutch, it's amazing! I love your hat! Of course I do, because I actually have that same one myself. Nothing better than a chunky sweater to complete an outfit. That clutch is insane. What a great buy! Loving the all black and the different textures! Adds interest and fun! Such a great look, love this! That clutch is amazing! It's a good pop of pattern in your black outfit! You have such stunning eyes! I absolutely love your accessories, especially the spiked bracelet! You should wear hats more often! I also am loving that fun little bag! So lovely this post!! Amazing hat!! I like the fringe, and your hair like that with the hat.